The Linksys dual-band routers are capable of transmitting and receiving data using both 2.4 GHz and 5 GHz frequencies, either simultaneously or one at a time. The 2.4 and 5 GHz Wi-Fi signal ranges are divided into a number of smaller bands called wireless channels. Each of these wireless channels translates to a specific radio frequency (Channel 6, for example, is 2.437 GHz). These factors can reduce your network’s performance. Changing channels is one of the best ways to resolve intermittent signal and to optimize your wireless connection. To learn how, click here. If you are using a Linksys Smart Wi-Fi Router, click here instead. The information below will further explain and differentiate your Linksys dual-band router's wireless channels. The 2.4 GHz band has 11 available channels that are .005 GHz away from each other with a Channel Width of 20 MHz. When your wireless device is set to channel 6, you are using the frequencies of channels 5 and 7 and half of 4 and 8. It’s best to distance your network at least 5 channels (25 MHz) away from others to avoid overlapping frequencies. Different but adjacent channels (such as 1, 2 and 3) use the same spectrum and will interfere with one another. Since EA6500, PAT and rain are 5 channels away from each other, their signals don’t overlap. On the other hand, LaLa, despite being on a different channel, interferes with EA6500 and PAT. Connection issues are easier to avoid on the less-crowded 5 GHz band. There are relatively few devices available that make use of this band; coupled with its 23 non-overlapping channels, the 5 GHz band is less prone to interference. Each channel is 20 MHz away from each other, providing more available bandwidth. 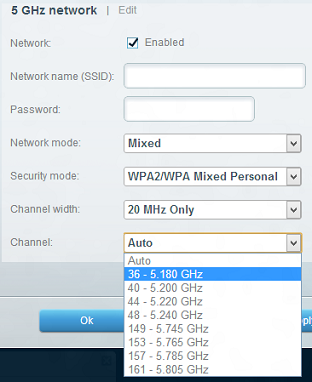 It is recommended to select the 2.4 GHz band for simple browsing and email. For media streaming and other heavy activities like gaming and Voice over Internet Phone (VoIP), consider switching to the less-crowded 5 GHz band. QUICK TIP: As wireless range decreases, the frequency increases. Thus, the 5 GHz band is ideal for home networks with devices that are not distant from one another. 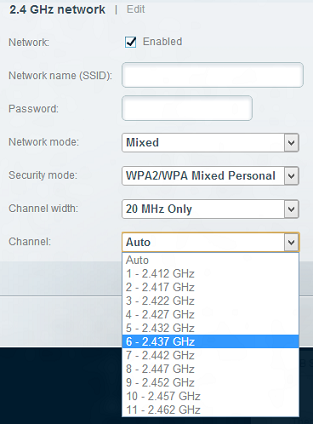 For a network that requires a wider reach, select the 2.4 GHz band. If you still experience connection problems after changing the wireless channel, you might need to add another device to your home network such as a switch or range extender. This way, you can connect more devices to the network and extend the wireless network range. To learn more about this, click here. Also, to get the latest networking products from the Linksys Store, click here.